The giclee comes ready to be hung at your home or office. Frame Especially selected by the artist for this piece. NO REFUNDS, NO RETURNS ,NO EXCHANGES due to the nature of the work being shipped. Shipping and handling estimated at $70.00. Especific quotes will be given with zip code. How do I make a RESERVATION for Tiger Gaze Giclée? Place your reservation now by emailing or calling us at 720 810 3297. STUDIO PRICE versus PRE-PRINTED PRICE, what is the difference? Studio Price is the regular full retail price. Anyone who reserves their Giclée now, before we go to press purchase receives a $ 50.00 saving. We are able to pass teh savings on to YOU. Shipping, handling and tax are additional. Checks and money orders made payable to "Bella Natura". No credit cards available at this time. Your signed and numbered Limited Edition Giclee of Tiger Gaze comes with a Certificate of Authenticity customly designed for the piece. What are the Giclée's framed MEASUREMENTS? 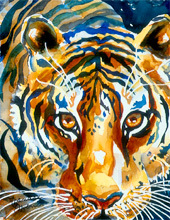 The outside measurements of your Tiger Gaze are 26"×23". How long will it TAKE TO GET my Giclée? Within 2 to 3 weeks from the order being placed and payment being received. Rush orders for the holidays are available. Donald D. Humphrey, Vice-President and Treasurer of Exxonmobil Corporation, private Tiger art collector.